Each cartel picks one or two chapters to discuss. Traditionally, psychoanalytic ideas concerning the ‘treatment of the psychoses’ are derived from what can be called the ‘neurotic paradigm’. It is implicitly assumed that neurosis constitutes a better solution to life that psychosis does, as it always maintains some sort of link with the symbolic Other and the imaginary other, by means of the possibility of sharing a language, a body and a reality. Lacan showed that all of this is basically achieved thanks to the establishment – in neurosis – of the signifier known as the Name-of-the-Father. In psychosis, this symbolic Father lacks (i.e. foreclosure), meaning the psychotic has to arrange for his own, private ‘suppletion’ (a term which implies it does not do its job as well as the Name-of-the-Father does). Lacan’s famous rereading of Freud’s pioneering Schreber-case, interesting as it may be, still falls under the scope of this ‘neurotic paradigm’. For all kinds of clinical, theoretical and even socio-cultural reasons however, it gradually started to dawn upon Lacan that the Name-of-the-Father itself had become no more than another substitute – be it a standard-substitute – for a structurally lacking signifier. And in addition, all kinds of psychotic substitutes for this Name-of-the-Father proved to constitute ‘better’ solutions for this lack, all of which eventually led to a language, a body and a reality that came much closer to the Real than the Father-ridden neurotic could ever dream of. So perhaps the time had come for a paradigm-shift. Perhaps the psychotic ‘Sinthome’ could constitute a new paradigm for the ‘flexible’ way in which today’s neurotics should be able to manage their relation with the remains of the Name-of-the-Father. The case which, for Lacan, epitomized this shift is that of James Joyce. In Seminar XXIII (1975-1976) Lacan developed the idea that Joyce’s way of writing – as culminating in “Finnegan’s Wake” – cannot be considered a symptom in the neurotic sense of the word, i.e. with a symbolic meaning derived from the unconscious or from the subject’s Oedipal past. Instead, it is radically cut from the unconscious. And thus it becomes something real, an infernal real machine of enjoyment – for Joyce himself. For this kind of symptom, i.e. the writing of Joyce, Lacan invents a new name, he calls it a ‘Sinthome’. Ever since, the question has become whether such a ‘Sinthome’ can become the base for a new form of social bond: with this Sinthome, with someone else’s ‘body of inconceivably private enjoyment’ we cannot any longer identify (impossible! ), so we try to read it, again and again and again. Maybe this the new form of respect, maybe this can become the base for a new form of ethics. In any case, throughout Seminar XXIII Lacan first of all verifies how this new ‘psychotic’ conception of the symptom – the Sinthome – allows for us to redefine the basic categories of the speaking being (i.e. the Imaginary, the Symbolic and the Real) and their Sinthome-assisted ‘knottings.’ But he also tries to map what this Sinthome implies for the psychoanalytic conceptions of the Father, the Woman and their superimpositions. Lieven Jonckheere is a Doctor of Clinical Psychology (master thesis on Kafka and doctoral thesis on Anxiety) lecturing in Psychology at the University of Ghent, Faculty of Economics and Business Management. 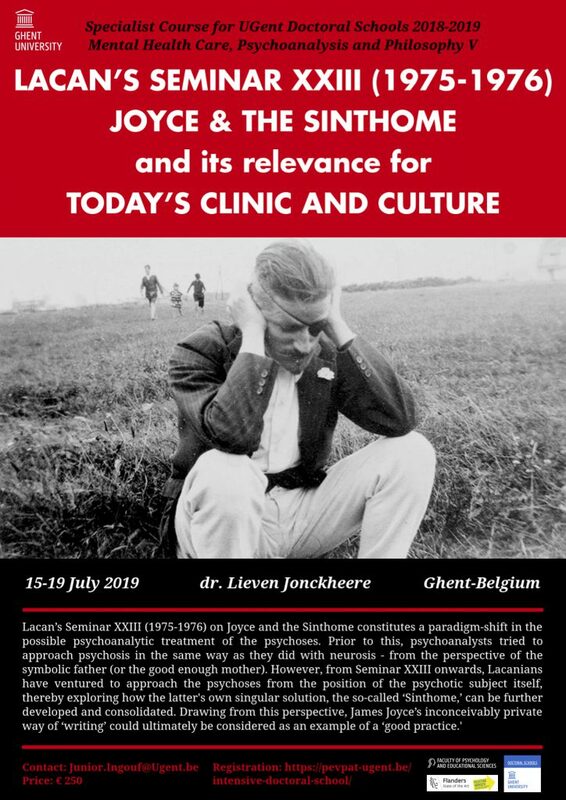 Lieven Jonckheere is also a psychoanalyst with private practice (Ghent). 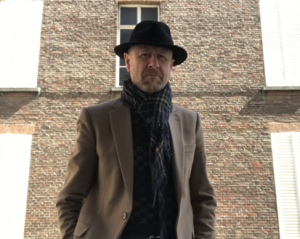 As a member of the New Lacanian School for Psychoanalysis and the World Association for Psychoanalysis, he is active in several local Lacanian societies and organizations (Kring voor Psychoanalyse, Programma Psychoanalytische Kliniek Gent, Permanente Vorming Psychoanalytische Therapie) not only as a lecturer, but also as a supervisor and – if need be – a political lobbyist. Lieven Jonckheere has published a book on sexual fantasies and wrote several articles on clinical issues (e.g. the classic clinic of neurosis (phobia), psychosis (melancholia) and perversion (pedophilia), the hypermodern clinic of autism, asexuality, hypersensitivity, anorexia, etc.) and cultural phenomena (e.g. art with Kafka, Duchamp, Fabre, movies; terrorism; Human Resource Management; etc.) as seen from a psychoanalytic point of view. He also regularly contributes to public debates (e.g. autism, law on psychotherapy). Assignment: Before attending the course, participants are expected to have read Lacan’s Seminar XXIII on The Sinthome (1975-1976). Registration is final after payment.